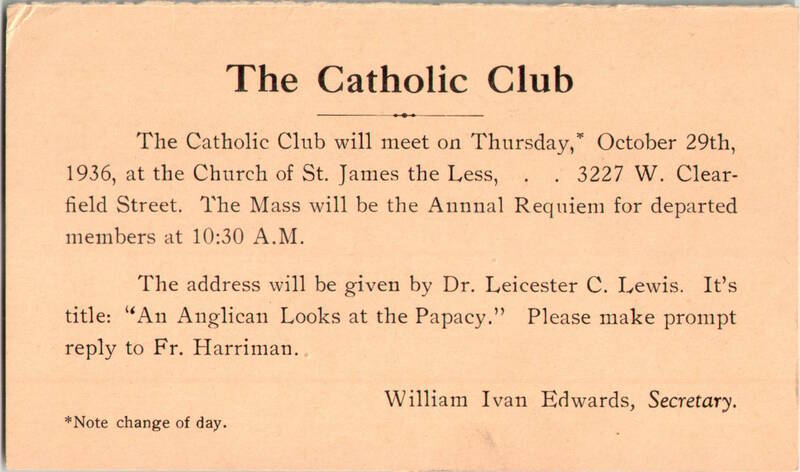 This entry was posted in Church of St. James the Less, Church of the Holy Trinity (Rittenhouse Square), St. Clement's Church, St. James's Church (Philadelphia) and tagged Anglo-Catholic Parishes, Charles Jarvis Harriman, Clerical Union for the Maintenance and Defence of Catholic Principles, Leicester C. Lewis, William Ivan Edwards on October 12, 2016 by mjk38. 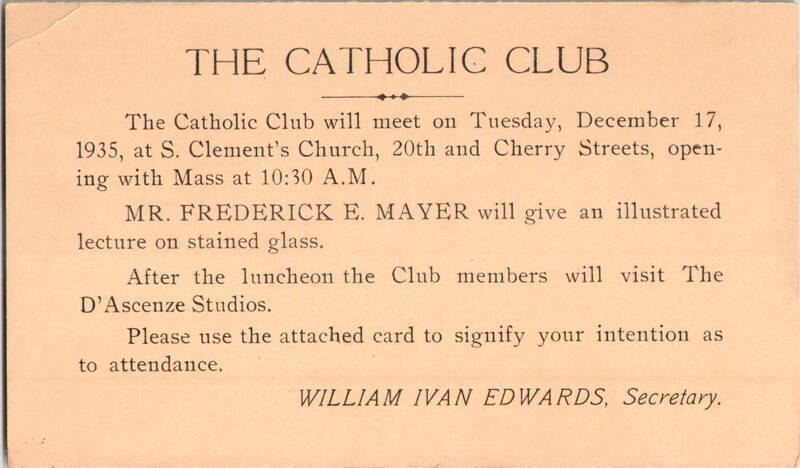 This entry was posted in St. Clement's Church and tagged Anglo-Catholic Parishes, Clerical Union for the Maintenance and Defence of Catholic Principles, Frederick E. Meyer, Nicola D'Ascenzo, William Ivan Edwards on October 12, 2016 by mjk38. 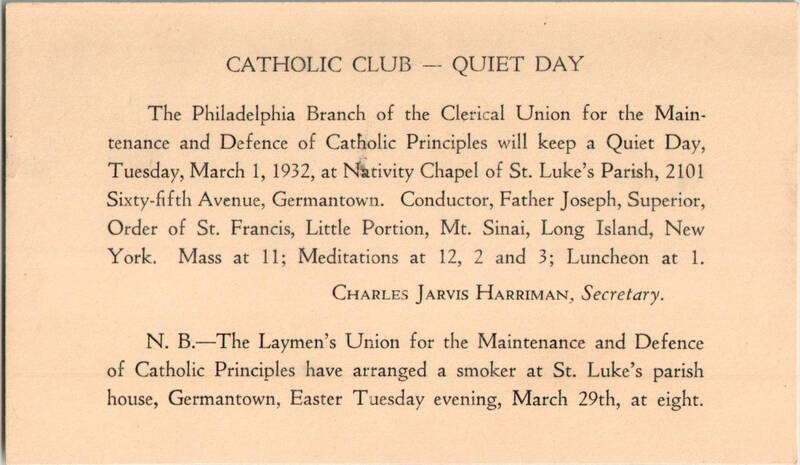 This entry was posted in St. Mark's Church (Philadelphia) and tagged Alfred G. Mortimer, Anglo-Catholic Parishes, Arthur Ritchie, Center City, Clerical Union for the Maintenance and Defence of Catholic Principles, Rittenhouse Square on January 5, 2016 by mjk38. 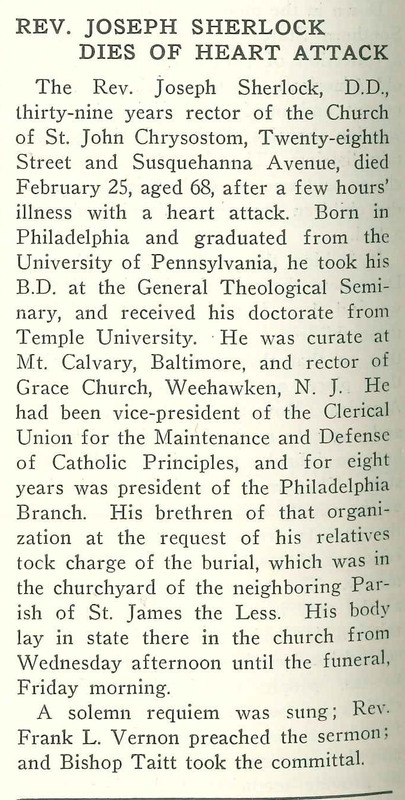 This entry was posted in Church of St. John Chrysostom and tagged Anglo-Catholics, Church News of the Diocese of Pennsylvania, Clerical Union for the Maintenance and Defence of Catholic Principles, Francis Marion Taitt, Frank L. Vernon, North Philadelphia on December 4, 2015 by mjk38. 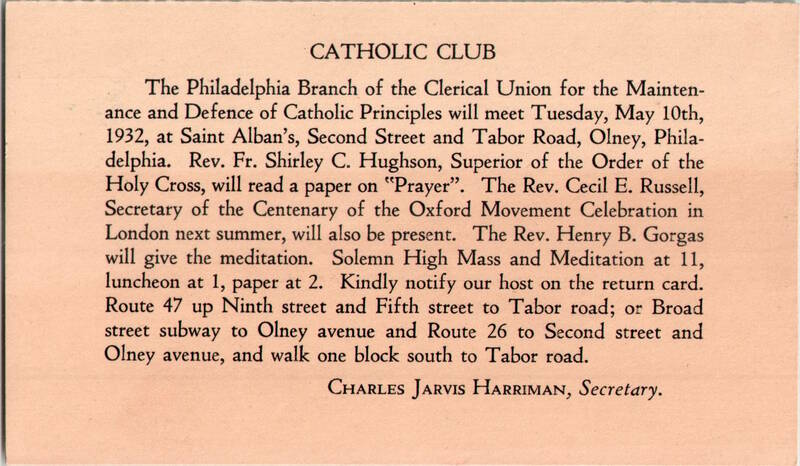 This entry was posted in St. Alban's Church (Olney), St. Clement's Church and tagged Anglo-Catholic Parishes, Charles Jarvis Harriman, Clerical Union for the Maintenance and Defence of Catholic Principles, Henry B. Gorgas, North Philadelphia, Olney, Shirley C. Hughson on September 9, 2015 by mjk38. 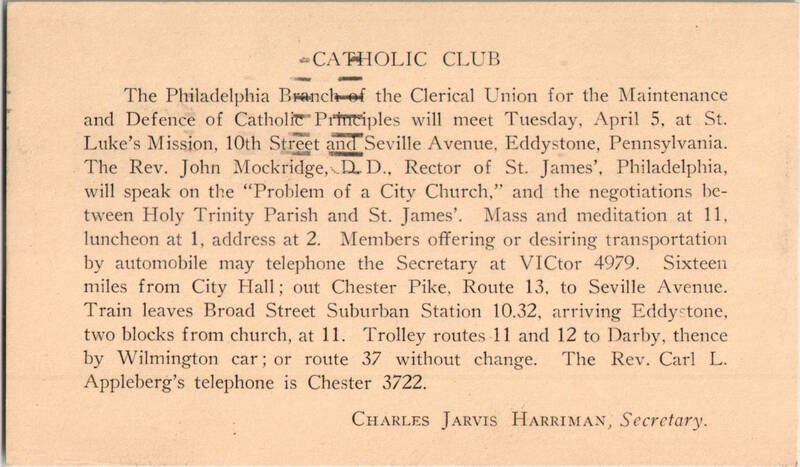 This entry was posted in Church of the Holy Trinity (Rittenhouse Square), St. Clement's Church, St. James's Church (Philadelphia) and tagged Anglo-Catholic Parishes, Charles Jarvis Harriman, Clerical Union for the Maintenance and Defence of Catholic Principles, John C. H. Mockridge on September 9, 2015 by mjk38. 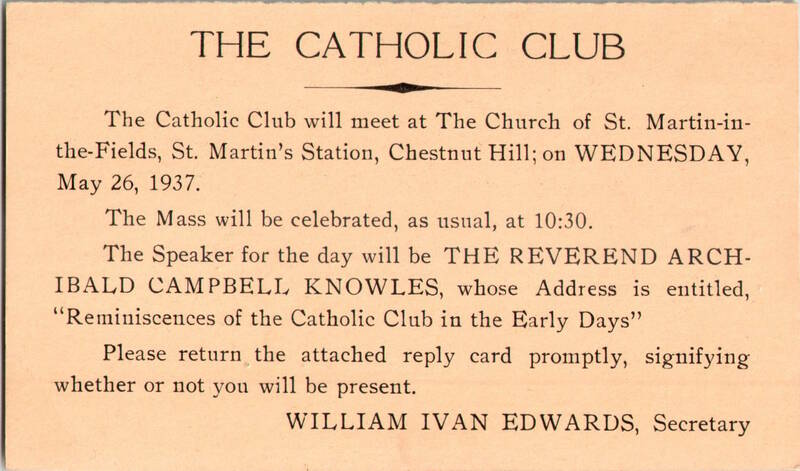 This entry was posted in Church of St. Martin-in-the-Fields (Chestnut Hill), St. Alban's Church (Olney), St. Clement's Church and tagged Anglo-Catholic Parishes, Archibald Campbell Knowles, Clerical Union for the Maintenance and Defence of Catholic Principles, William Ivan Edwards on September 9, 2015 by mjk38. 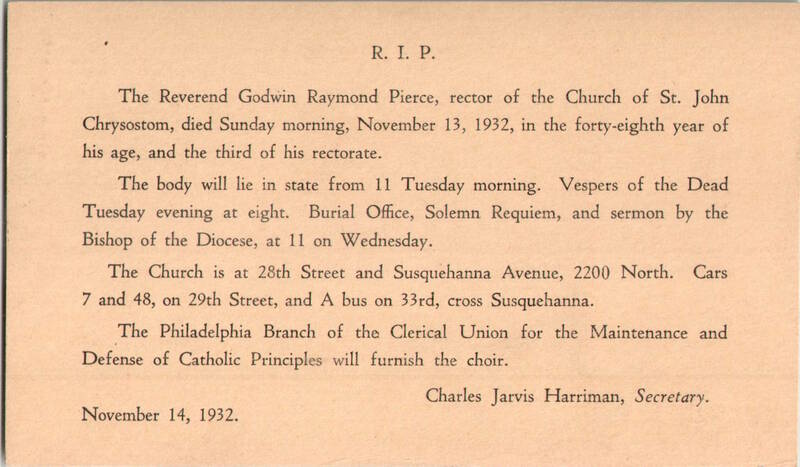 This entry was posted in Church of St. John Chrysostom and tagged Anglo-Catholic Parishes, Charles Jarvis Harriman, Clerical Union for the Maintenance and Defence of Catholic Principles, Godwin R. Pierce, North Philadelphia on July 26, 2015 by mjk38.